Vishi is one of the most important festivals of Kerala.It is celebrated on the first day of Malayalam month of Medam(usally April 14th), which is the astronomical New Year Day.As per popular belief, the fortune of that year is based on the object they see first on this particular day.So the first thing people see on Vishu, the ‘Vishukkani'(the lucky sight or gift) is decisive to the year’s prosperity. 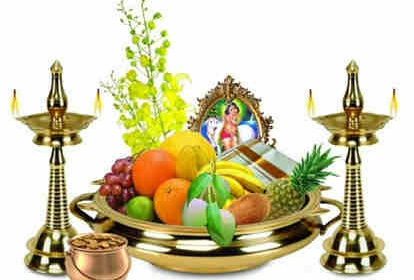 Thus the ‘Vishukkani’ has over the years become a ritual arrangement of auspicious articles like raw rice, fresh linen, golden cucumber, betel leaves, arecanut, metal mirror, the yellow flowers ‘konna’, and a holy text and coins, in a bell metal vessel called ‘uruli’ is placed before the statue of God Shree Krishna, A lighted bell metal lamp called nilavilakku is also placed alongside. On the day of Vishu, people awake early in the morning at around 5 am and they see the kani. Each member of the family is taken to the room where kani is kept by the elder member in the family. They are not allowed to see anything else before seeing the kani and so are taken to the room with their eyes closed. It is then followed by giving kaineetom. It is the practice of giving money by the elder members to the younger ones. The children then crack fires.